Services should Apply AP DCHS Anantapur Recruitment 2017 before the last date. Registered with Medical Council they are eligible. For Anantapur Govt APVVP Hospitals Staff Nurse Notification 2017 like age limit, Education details. Must have Qualified in B.Sc in Nursing Form recognized University. Between 18 years to 42 years as on 30-09-2017. Candidates will be done through Merit List. subject to maximum of 10 marks. All Eligible aspirants need to pay the Application fee RS.100/- through DD. to be enclosed along with application at the time of submission only. certificate) (not older than 3 months). Study certificates from Class-IV to Class-X(for local status). proof of Date of Birth). (Rupees one hundred only) is to be bank in favour of “District Co-ordinator of Hospital Services (DCHS), Ananthapuramu. 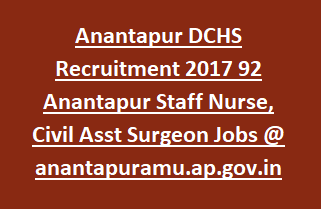 Download Notification for DCHS Ananthapur APVVP Hospital recruitment of Staff Nurse jobs.